The Realme 3 arrived in stores in India on March 12 when it sold 210,000 units. Three weeks later, the number has risen to more than 500,000 units. Earlier today there was a sale at Realme.com and Flipkart, which helped push it over the half a million mark. The next sale will be in a week (on April 9) at 12:00pm, again available through the official site and Flipkart. It will be INR 9,000 for the 3/32GB model and INR 11,000 if you want the 4/64GB one. 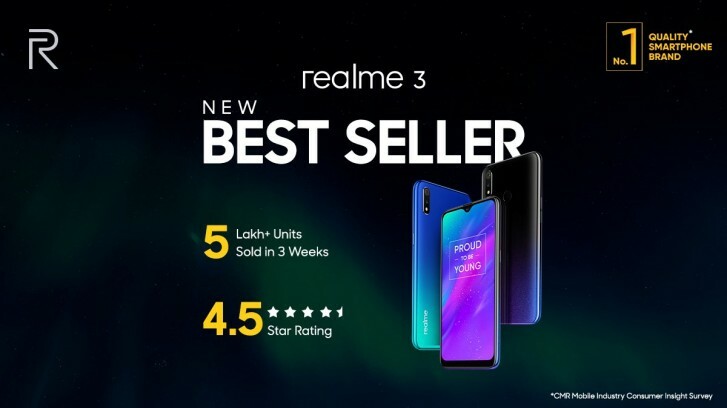 The Realme 2 is currently the most successful model from the brand (with over 2 million sales), but it only sold 200,000 units during the first sale. This means the Realme 3 is on track to beat it. Earlier today, the Realme U1 was permanently discounted to INR 10,000 for the 3/32GB model and INR 12,000 for the 4/64GB option. This one is available from Amazon. That's fine to me, Its not a deal breaker for a lot of people. Minimal and important updates are much more important. I believe this is only in India, I'm from the Philippines and these sold out like pancakes. Thsi and the Redmi Note 7 are always sold out.